Our cruise starts from Vlychada port and the first stop is at the magnificent volcanic Red Beach where you can swim in crystal clear waters, try snorkeling and admire a jaw-dropping landscape. 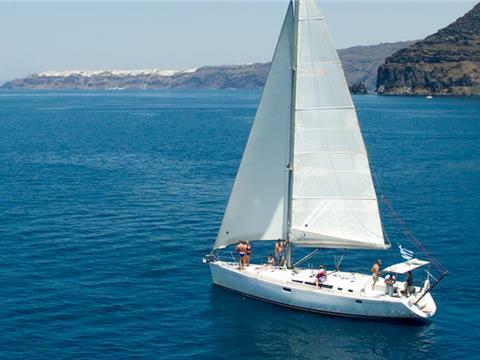 Then, as we sail towards the volcano, you have the chance to set eyes on White Beach, which is another spectacular scenery of the island, the admirable lighthouse of Akrotiri and a distinctive rock formation on the caldera cliffs, called The Indian Rock. At the volcano you will have a unique experience as you can swim in its hot springs that own healing waters and explore the volcanic islets of Palaia Kammeni and Nea Kammeni where the natural colors will amaze you. Next we sail around the volcano and anchor there in order to take in the splendid view and enjoy a delicious Seafood BBQ lunch or dinner, specially prepared and served from the crew. In the meantime, you can swim or go snorkeling (snorkeling equipment is available on board) in the volcano’s waters. Afterwards, we sail along the uninhabited Aspronisi Island, opposite of Santorini, and we reach Mesa Pigadia Beach, a lovely peaceful cove, for swimming, snorkeling or just sunbathing on deck. 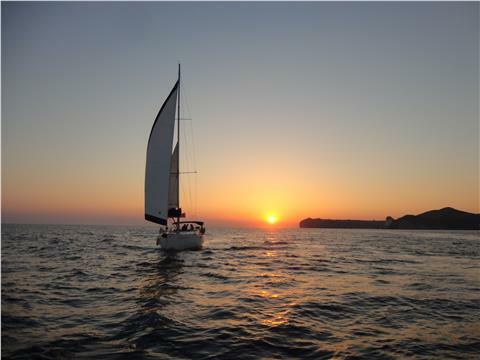 Finally, we sail back to Vlychada marine. Departure time and arrival time depend on whether you choose the morning or the sunset cruise. If you choose the sunset tour, you will have the opportunity to experience one of the most sought after sunsets in the world while on board.